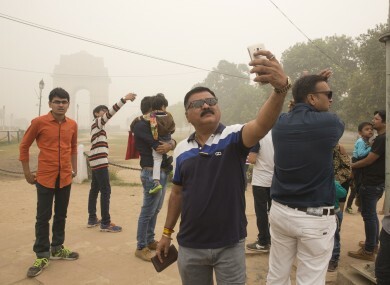 Indian tourists take selfies next to the war memorial India Gate in New Delhi earlier this month. INDIA OFFICIALLY HAS the filthiest air on the planet, and Delhi is its capital of smog. As part of a trip to charity projects in Mumbai and Dewas, I decided to check it out for myself. Twice. Despite temperatures that would have justified the term Indian Summer in Ireland, you couldn’t see the sun for days on end. The pollution in Delhi was so bad you could taste and smell it – like a massive smoking room. It got so bad that the authorities closed schools for three days, banned all construction work for five days and temporarily closed power plants. India’s capital is not one city, but seven cities built on top of each other. The latest layer – New Delhi – was built between 1911 and 1931 by the British, who inaugurated it as the new capital of an eastern empire that stretched from the edge of Iran to the straits of Singapore. The former Viceroy’s Palace is its architectural pinnacle. I’d like to tell you what it looked like, but I couldn’t see it. In fact, viewing anything much farther away than 10 or 20 feet was hugely problematic. During our stay in the city, the recorded levels of PM 2.5, a type of fine particle pollution, soared to 1,000 – more than 16 times the limit considered safe by India’s government. Anything above 500 is considered “hazardous”. For context, Dublin’s air quality index this week was 19 – considered “good” – while the highest in London was 45. Little wonder that Delhi’s chief minister has termed the city a “gas chamber” and hospitals recorded a large-scale outbreak of respiratory illnesses. The pollution is so bad that many Indians – and slack-jawed western tourists – have begun taking smog selfies. This disposable facemask was the best protection I could get from the pharmacist. A political decision managed to worsen the situation. During the nadir of the smog crisis, the federal government – led by right-wing Hindu nationalist BJP – decided to invalidate 85% of its banknotes in a bid to clamp down on tax evasion. In a country blighted by a caste system presaged on the prehistoric notion that lower castes and Dalit (or Untouchable) people must remain poor to burn up their “karma”, the cancellation of swathes of legal currency hit the poorest hardest. Comments by the prime minister suggested that may have been the point all along. The controversial move involved shutting down all ATMs for days on end, leaving tourists unable to withdraw currency to pay for cabs, food and other essentials. Most were, however reluctant to openly criticise central government policy. One man I spoke to, an IT worker used to travelling to Europe and the US, literally looked over his shoulder. Once persuaded I wasn’t going to shop him to the BJP, Sanjay* said that Narendra Modi’s administration seemed keen to push conservative Hindu policies upon India’s population, a population which includes 170 million Muslims, around 30 million Christians, 9 million Buddhists, and 52 million Sikhs, Jains and Zoroastrians. Prior to coming to power, Modi was an international pariah for a decade due to his alleged role in mass killings of Muslims during his time as a regional minister. His opponents in Delhi say he has been slow to act on the smog crisis, due to a power struggle with Delhi’s chief minister, Arvind Jeriwal of the rival Aam Aadmi Party. But the currency crisis isn’t just being felt in Delhi. Landing in Mumbai Delhi, I needed to transfer between the domestic and international airports, but couldn’t get a taxi as I couldn’t access cash due to the ATM shutdown. I ended up booking into a cheap hotel, which then sent a taxi to transfer me between the airports. The hotel was then able to charge me for the cab through the hotel booking. It was expensive, but unlike many Indians hit by a double whammy of smog and demonetisation, I had enough to eat. Despite spending billions on a huge army, nuclear weapons, and a space programme, India’s far-right BJP government presides over a population that remains one of the poorest in the world. Hamstrung by a stubbornly resilient caste system, some 80% of its population are in the lower half of the global wealth distribution – a higher proportion than in Africa. About half the population defecates in the streets daily. With winter approaching and very little fuel available, the country’s multitudinous poor resort to burning whatever they have to hand, including plastic. Out in the countryside, meanwhile, rice farmers in the nearby states of Punjab and Haryana burn leftover straw every November, sending smoke over Delhi. Images from Nasa show the extent of the fires, which are swept towards the capital by prevailing winds. The problem contributes to 70% of the peak smog problem. And then there’s Diwali. The Hindu festival is India’s version of Christmas – replete with red-and-white ads. Commemorating the abduction of the god Rama’s wife, her rescue, and Rama’s questioning of her ‘honour’ on the way home, the festival is celebrated by widespread fireworks. Visiting Delhi on the weekend of Diwali felt like the end of the world, as four times the population of Ireland began exploding fireworks that sound like munitions in the sky, then all took to the roads to escape the pollution. Dublin has never seemed so clean. The government responded by banning firecrackers for weddings – but not for religious festivals. Delhi’s chief minister appealed to his rival Modi to intervene with other state governments to help. A ban on crop burning is rarely enforced, and court judgments ordering ageing vehicles off Delhi’s roads are also routinely flouted. Within India, the country’s widespread problems are routinely compared to those in China, which was recently overtaken by India for the number of premature deaths related to air pollution. India has a 62.4 concentration of levels of the poisonous PM2.5 particle, compared to 54.3 in China, according to the World Health Organisation’s ambient air statistics. China’s Communist Party has managed to stem the tide of pollution by ordering factory shutdowns and cars off the road with ad hoc edicts. “We have repeatedly failed to implement the laws in India,” Mahesh Palawat, chief meteorologist at private weather forecaster Skymet, told AFP recently. China is using technology and strict implementation because the authorities recognise air pollution as a health emergency and are doing everything to control it. Although the wind has picked up in the past few days – bringing Delhi’s pollution back to merely atrocious – the fallout from the smog and currency crisis continues, with protests across several cities this week. Meanwhile, the millions of Indians still living in grinding poverty in a growing economy look in envy at China’s progress in modernising its society, untrammeled by the stigma of inhuman superstition. Email “Spending a day in Delhi is the equivalent to smoking 40 cigarettes. We went to see for ourselves”. Feedback on “Spending a day in Delhi is the equivalent to smoking 40 cigarettes. We went to see for ourselves”.